"Now I have you with me, under my power; our love grows stronger now with every hour; look into my eyes, you'll see who I am; my name is Lucifer, please take my hand." Arguably the first heavy metal band, Black Sabbath for more than 30 years has influenced generation after generation of not only new heavy metal bands but also a great many involved in other music genres, from industrial to modern to even rap. Although the early 1980s saw the decline of this powerhouse, the late 1990s brought the original band members back together, once again infusing the music world with a well-deserved boost of energy. Very few bands have ever even come close to the 'heaviness' that is at the core of Black Sabbath. Geezer Butler's bass, Bill Ward's percussion, and Tony Iommi's guitar combined to create the sound that other acts embraced but never quite equalled. As Black Sabbath evolved, they too lost that sound (Never Say Die is a classic example), but fortunately they managed to rediscover it again and again as the years went by, each time bringing forth the juggernaut that is the very heart of the heavy metal genre. Black Sabbath has been through four stages so far in its long and distinguished career: the Ozzy years, the Dio years, the vocalist-of-the-month years, and (finally) the reformed years. 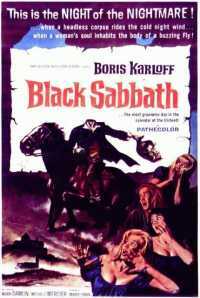 Black Sabbath began when Tony Iommi and Bill Ward answered an advertisement from Ozzy Osbourne, who needed a gig. Joined by Terry 'Geezer' Butler, the four formed a blues-based band first known as 'Polka Tulk' then (at Bill Ward's suggestion) 'Earth'. There were very few pubs and clubs that catered to the blues, so the band elected to play more straightforward rock 'n' roll. Unfortunately, there was another band named 'Earth' at the time, a band that played more 'high-brow' fare. The latter band elected to change its name after being confused with the high-brow outfit. It was Geezer Butler who proposed a name change to Black Sabbath. The name came from a 1963 Boris Karloff film [the Italian I Tre Volti della Paura horror anthology made by Mario Bava (whose most well-known film is Black Sunday, which starred Barbara Steele), in which Karloff serves as host and narrator]. In 1970 the band released its self-titled debut album, which subsequently made its way to the top 10 on the British charts. It was this album that initially linked heavy metal with the supernatural, and more specifically, Satanism. As with most events that eventually become clichés, the truth was stranger than fiction. Although the song N.I.B. dealt with Lucifer, it portrayed the fallen angel as a reformed person who falls in love and elects to relinquish his evil ways. Even the song Black Sabbath, with its occult trappings, is in the end a warning to stay away from the occult and forbidden knowledge. The record company's public relations arm, however, elected to place an inverted cross on the inside sleeve of the record album. Black Sabbath was branded as a satanic band forever. Side one of Black Sabbath is pure hard-driving heavy metal; side two is equally heavy, but the songs are not as strong. Of the songs, N.I.B. is perhaps the best, with Black Sabbath and The Wizardfollowing close behind. Many fans believe that N.I.B. stands for 'Nativity In Black', but Ozzy Osbourne provided a much more humorous explanation. The song was originally titled 'Nib' because Bill Ward's beard at the time was formed very much like a pen nib. Go figure. Later in 1970, Black Sabbath unleashed Paranoid, which solidified the band's heaviness and expanded the band members' song writing skills. For good or ill, the song Paranoid has become the signature song for Black Sabbath, at least on FM radio, where is receives quite a bit of airplay to this day. Much more exciting and heavier are the songs War Pigs/ Luke's Wall, Iron Man, and Fairies Wear Boots. Released in 1971, Master Of Reality brought forth Sweet Leaf, which reflected the band's experimentation with drugs and its culture (this continued with their fourth album, Vol. 4, with the song Snowblind). The album also featured the song Solitude, whose style served as a prototype for what later would become doom-death (exemplified by bands such as Opeth, My Dying Bride, and Anathema). The band's first three albums have become the blueprints for generations of doom and stoner metal bands. Examples of doom bands include Church Of Misery, Solitude Aeturnus, and Candlemass. Examples of stoner or psychedelic metal bands include Electric Wizard, Nebula, and Orange Goblin. Two years after Vol. 4, Black Sabbath released in what my opinion was the last of their 'heavy' albums, Sabbath, Bloody Sabbath. Although the remaining albums produced during the Ozzy years are solid efforts, more and more Black Sabbath turned away from its wailing riffs and supernatural lyrics and instead embraced traditional riffs and words. Indicative songs of this period speak for themselves: Back Street Kids, Rock 'n' Roll Doctor, and Breakout. In 1978, Ozzy and company completed their final album together, releasing Never Say Die. The band's experimentation with drugs and alcohol reached its apex in the late 1970s. Ozzy Osbourne in particular succumbed to their effects, and in the end the remaining members fired him. It was a horrible time for everyone; band members were stunned and deeply hurt. With Ozzy gone, the remaining members of Black Sabbath found themselves without a vocalist. To many fans, this proved to be the end for the only Black Sabbath they would ever choose to acknowledge. In 1979, Ronnie James Dio (former vocalist for Elf and Rainbow) joined Black Sabbath, thus infusing the band with renewed energy. The heaviness was back, with songs like Lady Evil, Heaven And Hell, and Die Young reigniting the bass and guitar riffs long ago forgotten. With Dio, the band expanded its song writing muscle as well, exploring fantasy (Neon Knights) and traditional themes (Die Young) without losing the heavy riffing expected from Butler and Iommi. Dio's strong vocal range enabled the band to play more melodic music, a definite strength that attracted many new fans. Unfortunately, this album was the last for drummer Bill Ward, who was replaced with Vinnie Appice. Ironically, to this day Ward has no recollection of ever recording this album. In 1981, Black Sabbath followed up with The Mob Rules, a top 20 bestseller with songs such as The Mob Rules, Turn Up The Night, Voodoo, and Slipping Away. Once again, Dio proved to be a formidable vocalist, perfectly complementing Butler's and Iommi's rhythms and chops. One year later, the band released Live Evil (get it? ), which covered the Ozzy and Dio years. Unfortunately, internal battles between band members got out of hand. In the end, Dio and Appice left Black Sabbath, leaving only two founding members. In the 1980s, Black Sabbath broke down until only one member remained (Tony Iommi). Although Ward and Butler participated on some of the albums, Black Sabbath could not find a vocalist strong and effective enough to bring about more Black Sabbath magic. Vocalists for the band included Ian Gillan (Deep Purple), Bey Beyan (ELO), Dave Donato, Glen Hughes (Deep Purple), and Tony Martin. Dio was replaced by Tony Martin once again, and the band released Cross Purposes and Forbidden. Black Sabbath had acquired new fans, and on the strength of these two albums, was doing quite well. Tony Martin began to hold his own, at last making the vocalist position his domain. However, no one knew of the surprise yet to come. 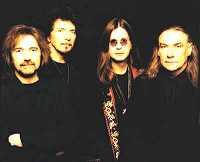 In 1997, Ozzy Osbourne, Bill Ward, Geezer Butler, and Tony Iommi at last came together, playing live sets on 4 and 5 December, at the NEC Arena in Birmingham (the band's hometown), England. In 1998, Black Sabbath released Reunion, which captured many of the Ozzy years tracks, as well as two new studio recordings, Psycho Man and Selling My Soul. Although the new songs are okay at best, it is great to hear the original line-up. As for the future, who knows? For those of you new to Black Sabbath (if that is at all possible! ), there is an anthology that may be of interest. In 1996, Castle Communications released a four-disc anthology titled Wheels Of Confusion, which covers Black Sabbath from 1970 to 1987. The majority of the collection focuses on the Ozzy years, but there is enough material to cover Black Sabbath's overall evolution to its present incarnation. The 60-page booklet contained in the anthology is alone worth the price, for it provides detailed liner notes and an array of rare photographs of the band throughout its career. There are a number of tribute albums dedicated to Black Sabbath, Ozzy Osbourne, and Dio. Nativity In Black, volumes I and II, feature a number of bands covering Sabbath staples. The breadth of generations on these discs shows the band's impact. Bruce Dickinson of Iron Maiden performs Sabbath Bloody Sabbath, Type O Negative takes on Black Sabbath, White Zombie attacks Children Of The Grave, Godsmack inhales Sweat Leaf, Primus joins Ozzy Osbourne in N.I.B., and Slayer slays Hand Of Doom. From NWOBHM bands to thrash to alternative metal and even into punk, rap (picture Busta Rhymes doing Iron Man), and industrial fusion, these representative bands and countless others all pay homage to the founders and kings of the metal genre. For those of you into video, Black Sabbath recently released a reunion video titled The Last Supper. Combining live footage with band interviews, the video is quite good, although Osbourne's swearing and on-stage antics at times detract from the awesome music created by Ward, Butler, and Iommi. The songs themselves are played with as much fervour and precision as in days past, thus showing that when the band is together it is unstoppable and incomparable. Ozzy Osburne has established a very successful solo career. He also is responsible for Ozzfest, an annual event showcasing the latest metal acts. Geezer Butler founded the band G/Z/R (presently renamed 'Geezer'), which for a time featured vocalist Burton Bell (Fear Factory). Bill Ward released a number of solo albums (One Last Winter and When The Bough Breaks), which find the drummer exploring the blues once again. In late 2000, Tony Iommi released a solo album titled Iommi, which featured a variety of vocalists, such as Skin (Skunk Anansie), Peter Steele (Type O Negative), Billy Idol, and Henry Rollins. Iommi recently released a new album in 2005, this one titled Fused and featuring Glenn Hughes on vocals. 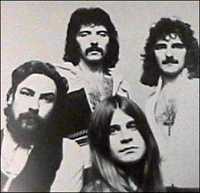 Black Sabbath is considered to be the genesis of heavy metal. (An interesting side note is that Iommi dismisses the heavy metal label and elects to think of Sabbath as a hard rock band.) Never once caring for what critics had to say and fiercely loyal to its fans, Black Sabbath stands alone as a true innovator in the world of heavy music. Every other band in this musical genre owes its existence to Black Sabbath. Nothing more need be said.